I’m sure you’ve heard about the week of riots that spread across the UK following an incident in London. The country was taken completely by surprise as out of the blue came throngs of angry hooligans looting and destroying streets of major cities. Many people have had their homes destroyed, their businesses emptied, some lost their lives. My sympathies are with those affected, I hope they can rebuild their lives quickly. I was particularly moved by those, who bravely and peacefully stood up to the mob to protect their communities. Those voices worry me greatly. What has happened was an effect of subtle interactions of numerous elements in a complex system. These outcomes were not anticipated because they could not have been anticipated. 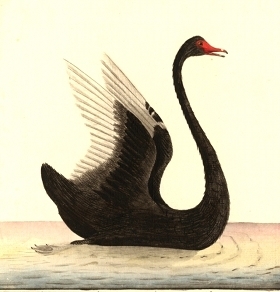 It was a “Black Swan“, a random event that occurred not just because of the things we didn’t know but of the things we could not have known. Any attempts to answer the question “why” are therefore destined to be partial, biased and irrelevant. Even if they achieve a notion of causality we’ll only be fooling ourselves. One seems certain, that we’ll spend a lot of money that could have otherwise be put to some good use. I have yet another issue with this urge to find answers (and, presumably, those responsible). Once we arrive at some conclusions (although we already know they will be wrong) we will be tempted to act on them. We will be tempted, and most likely follow that temptation, to make changes, put rules, laws and regulations in place. To what effect? Most likely to fool ourselves again that now, we have dealt with the issue and need not think about it any more! Perhaps we could, instead, look more broadly, try to understand the society and accept that “there are more things in heaven and earth…”.